Doug Millham is a visionary executive administrator with extensive background in nonprofit organizations. In 1989, he co-founded Discover the World, a Christian nonprofit organization with his wife Jackie. The goal of this project was to design and facilitate short-term volunteer opportunities for individuals to serve the poor, both locally and around the world. Doug is uniquely qualified to work in cross-cultural settings, having spent two decades working, training and writing in the area of relief and development. 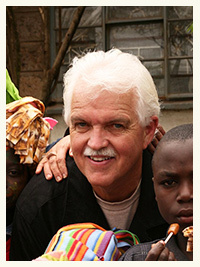 In 2003, under Doug’s direction, Discover the World began establishing residential and school facilities for children who have been orphaned by the HIV/AIDS crisis in Kenya. By the start of 2009, these programs had served over 500 children and the communities around them.